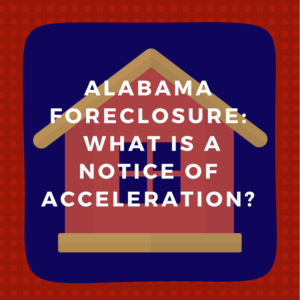 Alabama Foreclosure: What is a notice of acceleration? So you have a mortgage and you’ve fallen behind on your payments, and you received a notice of default letter. Unfortunately, you’re not able to fix this. It means you owe everything now. Instead of paying a $250,000 loan over 30 years, $250,000 is due now. If you don’t pay if off now, the mortgage company will foreclose on you. Normally in this letter, they’ll tell you that in 30 days, there will be a foreclosure sale on your property. They will also advertise your property in the newspaper for 3 consecutive weeks, and during legal hours they will foreclose on you. If you’re at this point, you are in critical danger of losing your home. It’s crucial to figure out where you are, what you’re doing to do, and taking immediate action. Otherwise, you’re going to lose your home. If you find yourself in this position, contact us. We would be glad to answer your questions and help you figure out your best course of action quickly. We also have some resources that may help you. 99.9% of our options do not involve bankruptcy. And often the best solution is to sue your mortgage company so a judge decides about the foreclosure. Most of the time your mortgage gives you the right to do this. You can reach us by phone at 1-205-879-2447. Or, if you prefer, you can fill out a contact form and we will get in touch with you quickly.